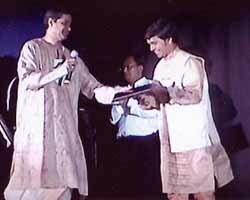 Manick Sorcar was honored for his "Untiring and Enthusiastic Efforts To Promote the Bengali Culture in North America" at the 19th North American Bengali Conference, held at the Santa Clara Convention Center, on last July 3, 1999.
of New York and Bay Area Prabasi at San Francisco. The special plaque was handed by Sri Prabir Roy, former Chairman of C.A.B. and the Working President of Biswa Banga Sammelan.